Trade Bait: Which players could fetch first-rounders? Matt Duchene has likely played his last game as an Ottawa Senator, making him the new No. 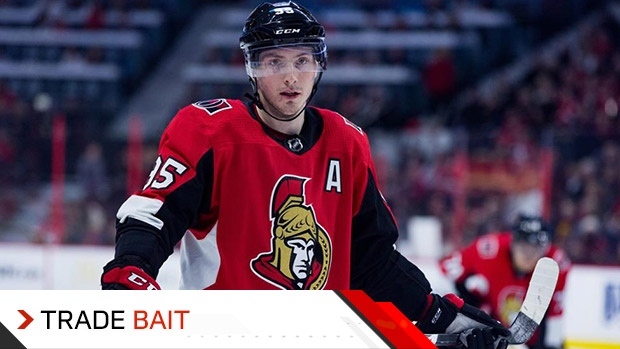 1 on the latest TSN Trade Bait board. The question is: How long will Duchene remain atop the list? Teammate Mark Stone could well knock him off the perch. He is deliberating whether to engage in talks with the Senators on a long-term extension after a significant offer was believed to be tabled in the past week. If Stone decides he would rather hit the market this summer he will jump to the top of the board as the most sought-after target for TradeCentre 2019. Pending free agent Jakub Silfverberg is off the board as he is closing in on a reported five-year extension with the Anaheim Ducks once their salary cap tagging space expands on March 1. Detroit Red Wings defenceman Nick Jensen has climbed up to No. 11 with serious interest growing in the affordable third-pair blueliner, while newcomers Alexander Wennberg (No. 18), Jason Zucker (No. 25) and Patrik Nemeth (No. 38) have all joined the board. The Senators do not currently own a first-round pick for June’s Entry Draft, but they may hold as many as three first-round slots by the time the deadline passes on Monday at 3 p.m. ET. Seven first-round picks were swapped last year during the deadline period, the most in a decade. Paul Stastny, Evander Kane, Rick Nash, Derick Brassard, Ryan McDonagh/J.T. Miller, Tomas Tatar and Ryan Hartman each netted a first. Which players could fetch a first-round pick this year? To start, the Big Three are a given: Stone, Duchene and Artemi Panarin, who still remains more likely than not to be traded. Then there is the next group, which likely includes rugged two-time 30-goal scorer Wayne Simmonds and rangy centre Kevin Hayes, who is already nearing his career-high of 49 points. The wild cards are Ryan Dzingel, Mats Zuccarello, Gustav Nyquist and Jimmy Howard. Depending on the circumstances, any one of them could bring back a first-round pick. If the Carolina Hurricanes would have gotten a first-round pick for Micheal Ferland, he would already be gone. The Red Wings have been holding out for one for Howard, who is a candidate to re-sign in Detroit even if he finishes this season as a rental elsewhere. The Calgary Flames and Carolina Hurricanes are believed to have kicked the tires on Howard recently. The diminutive Norwegian winger Zuccarello, 32, seemed a longshot to return a first-rounder as recently as mid-January. He’s been one of the hottest players in the NHL with 22 points (seven goals) in his last 14 games. Dzingel has been in many ways the forgotten Sen in the shadow of Stone and Duchene. But he’s where it really gets interesting for Ottawa. They could make a last-minute push to sign him, but a first-round pick for Dzingel could potentially give them three this year – and give GM Pierre Dorion plenty of ammo to either restock the cupboard or package the picks to move back up into the lottery zone they could have been enjoying all along. Dzingel, 26, is having a career year with 22 goals and 44 points. Hartman fetched a first-rounder and he had just eight goals and 17 points at the deadline. So, which teams could have first-round picks on the move? Three teams have already traded this year's pick: Toronto (Jake Muzzin), San Jose (Erik Karlsson/Evander Kane conditional) and St. Louis (Ryan O'Reilly). 1. Winnipeg Jets: See No. 5 on the Trade Bait board. GM Kevin Cheveldayoff is certainly big-game hunting, studying all of the top names on the list. 2. Nashville Predators: David Poile has been in ‘all-in’ mode, engaged in a Central Division arms race with the Jets. 3. Tampa Bay Lightning: The Bolts owe their first-round pick to the Rangers this year if they win the Stanley Cup, so any trade would have to include counter-conditions to move to 2020. 4. Calgary Flames: The Flames are neck-and-neck with San Jose in the race to get the prize of the Western Conference’s turtle race for the second wild-card spot. But which is a bigger priority: goaltending or depth scoring? 5. Pittsburgh Penguins: Jim Rutherford has traded his first rounder every year he’s been GM of the Pens. 6. Boston Bruins: Are the surging Bruins gun-shy at all after the Rick Nash experiment didn’t work out as planned last spring? 7. Columbus Blue Jackets: With Panarin potentially on the move, the Jackets may be in a position to both give and get first-round picks. 8. Vegas Golden Knights: George McPhee’s trade deadline track record took another hit last year when trading a first, second and third-round pick for Tomas Tatar. 9. Dallas Stars: Jim Nill hasn’t tipped his hand, but some wonder whether Dallas could be a sneaky big buyer this year. One issue is the Stars’ inconsistency. 10. Washington Capitals: All signs point to a smaller addition, like Michal Kempny, who was one of the best value pickups in recent deadline history. 11. Montreal Canadiens: Marc Bergevin is on the record saying he does not plan to trade futures to help the Habs, who have not reached contender status. 12. New York Islanders: In 32 years as a GM, Lou Lamoriello has only traded a first-round pick twice at the deadline - for Ilya Kovalchuk (2010) and Jamie Langenbrunner/Joe Nieuwendyk (2002).